Greed: A Confession showcases D.R. Goodman’s honed sensitivity to the human experience and the natural world around us. Her sensible scientific background melds with a meditative outlook: “this// is a vertebra/ from a cow.// It will win no prize./ It is just the childish wonder/ from which the rest derives.” This collection is a wellspring of keen observations, insight and secrets of nature, freely spilling out for those greedy for knowledge and enlightenment—as in the immediacy of “a certain joy/ that depends on nothing” and “wraps a tightness around your heart.” Here is a masterfully crafted finalist for the 2013 Able Muse Book Award—one brimming with delight, wit and insight. I feel incredibly fortunate to have learned of D. R. Goodman’s poetry. Her technical control and powers of observation are extraordinary; diction, meter, and rhyming, superb. Writing about an egret, she details its “mind,/ a laser-focused eye, the weight of will”—attributes that apply equally to the poet. In “Autumn in a Place Without Winter,” she says, “The season brings/ no clarity, but this: we’re here, alive. . . .” This poet is alive to everything. You want this book. It’s terrific. 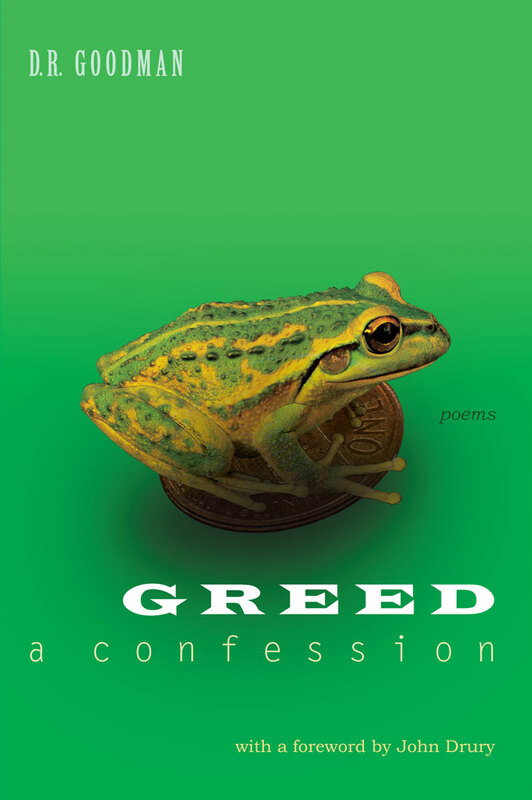 Goodman is greedy for things of this world—not in the rapacious, bottom-line manner of plutocrats, misers, and Wall Street brokers but for the enlightenment of the senses and the enrichment of her poetry. She’s sharing the wealth she accumulates. D.R. 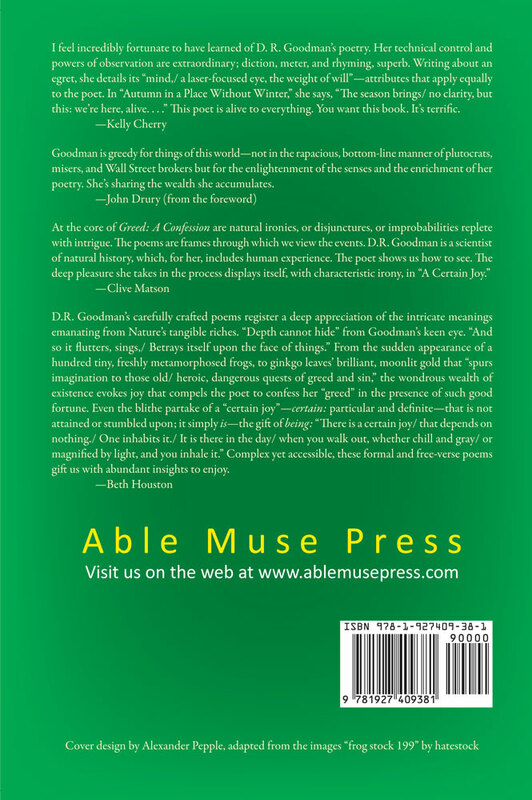 Goodman’s carefully crafted poems register a deep appreciation of the intricate meanings emanating from Nature’s tangible riches. “Depth cannot hide” from Goodman’s keen eye. “And so it flutters, sings,/ Betrays itself upon the face of things.” From the sudden appearance of a hundred tiny, freshly metamorphosed frogs, to ginkgo leaves’ brilliant, moonlit gold that “spurs imagination to those old/ heroic, dangerous quests of greed and sin,” the wondrous wealth of existence evokes joy that compels the poet to confess her “greed” in the presence of such good fortune. Even the blithe partake of a “certain joy”—certain: particular and definite—that is not attained or stumbled upon; it simply is—the gift of being: “There is a certain joy/ that depends on nothing./ One inhabits it./ It is there in the day/ when you walk out, whether chill and gray/ or magnified by light, and you inhale it.” Complex yet accessible, these formal and free-verse poems gift us with abundant insights to enjoy. A native of East Tennessee, D.R. Goodman now lives in Oakland, California, where she is founder and chief instructor at a martial arts school. Her poetry has appeared in several journals, such as Crazyhorse, Notre Dame Review, Wisconsin Review, Cold Mountain Review, Whitefish Review; and the anthology, Sonnets: 150 Contemporary Sonnets. She is the author of The Kids’ Karate Workbook: A Take-Home Training Guide for Young Martial Artists (North Atlantic/Blue Snake Books); and an illustrated chapbook, Birds by the Bay.